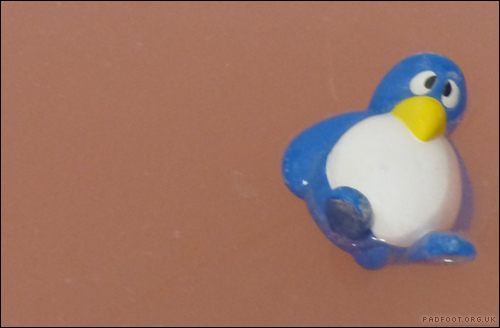 Something caught my attention as it flew past the window. I only spotted it out of the corner of my eye, so I wasn’t too sure what it was, but thankfully it decided to land on one of the plants in the garden for a bit of sunbathing! It chose the most colour co-ordinated plant in the garden – my vibrant “Orange Dream” Acer, and seemed happy to pose for photos. I’m a novice when it comes to identifying butterflies, so armed with the photos, we had a look through our Collins guide to butterflies and moths. 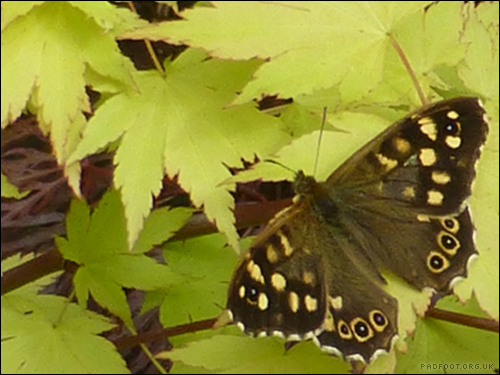 This particular one is a Speckled Wood Butterfly, which according to the RSPB, is commonly found in woods and tall vegetation across southern England. I think this particular one must have been a little lost though, as two Acers in pots hardly count as woods or tall vegetation! After a while of sunbathing and posing for photos, it flew off, presumably in search of a slightly taller tree to settle on. This entry was posted in Dragon Goes Wild on May 31, 2016 by Dragon. Looking out of the window, there’s a lot of trees & bushes on the hill in the distance. Nothing unusual about that, apart from the colour of them – these aren’t green, but have a silvery white look to them. 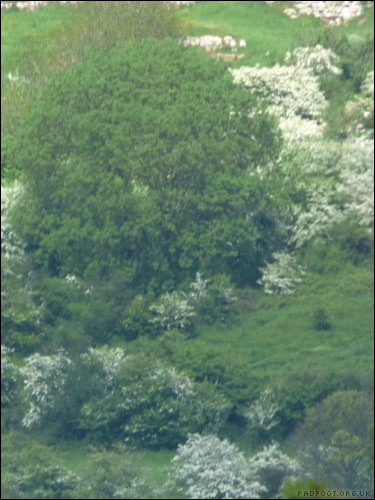 Curious to know what they are, I asked a relative, who dug out a book on hedgerows and showed me a picture of a Hawthorn, complete with white flowers. Flowering in May and early June, it goes on to produce berry-like fruits known as Haws (hence the name). According to wikepedia, these haws are a delicacy for birds like Thrushes and Waxwings. This entry was posted in Dragon Goes Wild and tagged 30 days wild, Hawthorn on May 30, 2016 by Dragon. If April showers bring May flowers, what do May thunderstorms bring? Yesterday started off nice and sunny, but the afternoon was a complete washout. 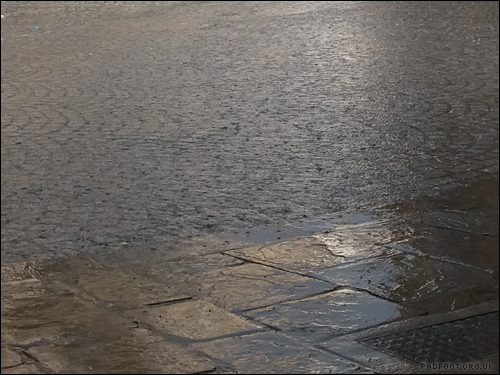 What began as just a spit and spot of drizzle, turned into torrential rain and thunder – not the best weather to be out on foot! Despite the thunder, I didn’t spot any lightning until the second storm of the day in the evening – no photos of that unfortunately, as I need more practise at taking lightning photos to get my timing right. 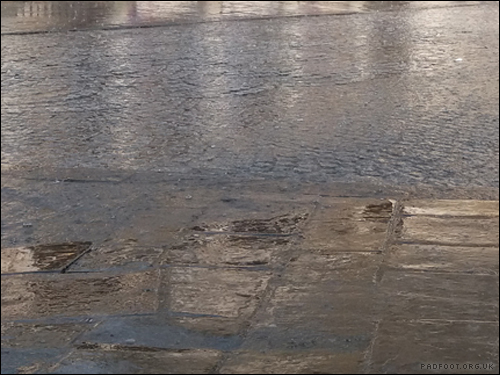 That’s actually a cobbled road in those photos, although it does look more like a lake. I think that proves that if there’s ever the slightest chance of rain in the weather forecast, you should always take an umbrella if you go out, just in case! This entry was posted in Dragon Goes Wild and tagged 30 days wild on May 28, 2016 by Dragon. 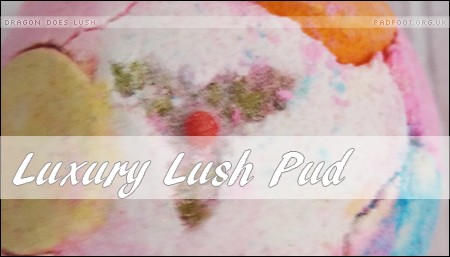 Ok, I know it’s not exactly seasonal, but I used my Luxury Lush Pud this week, and had to blog about it! As you drop it into the bath, it starts fizzing immediately – the aroma of Tonka and Lavender (which incidentally is shared with Twilight) makes for a very relaxing bath, while not being overpowering. I’m not a fan of ‘girly pink’ but I will admit the bath water turned a pleasant pink shade once the bath bomb had dissolved – the coloured discs and holly decoration on the top took a little longer to dissolve fully. There’s no popping candy in the bath bomb, so the ‘display’ relies entirely on the scent and the colour – it’s definitely one I will be buying again, if it returns in the Christmas range this year. But if it doesn’t, then there’s always Twilight! 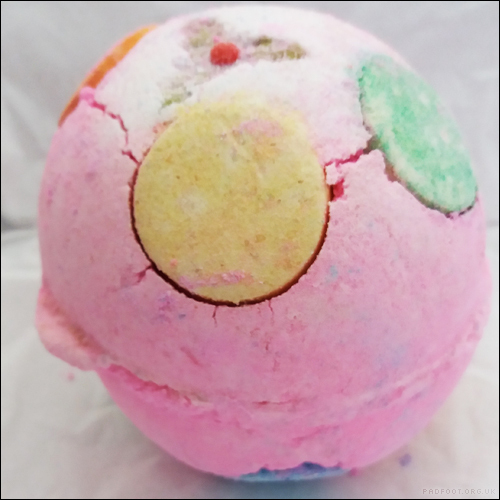 This entry was posted in Bath Bombs and tagged Christmas 2015 on May 27, 2016 by Dragon. 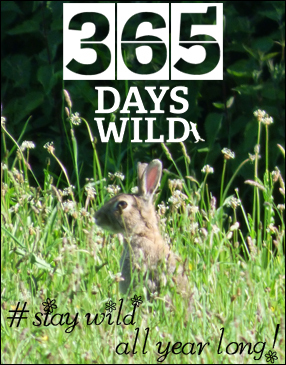 30 Days Wild – starting soon! 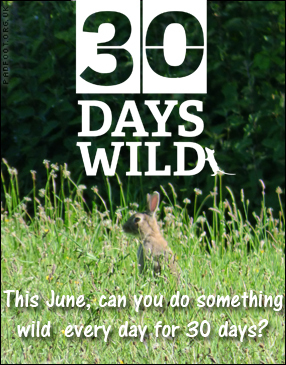 There’s only a few days left in May, which means that 30 Days Wild will start very soon! Organised by The Wildlife Trusts, the aim is to get people doing something wild every day in June. When you sign up, you get sent a pack (either in the post or by email) which includes a pack of “random acts of wildness” cards. These have some great ideas for wild activities, ranging from map your local wildlife to look up at the clouds. But you aren’t just restricted to the suggestions on those cards – you can do anything wild! If you want to find out more about 30 Days Wild, just follow the link, where you can get more suggestions of wild activities and sign up to participate. I don’t know what the appeal is of this particular tree, but there isn’t a point in the day when there’s not a crow perching near the top of it. Well, I call it a ‘crow’ but there’s also a larger crow-like bird which I’m guessing is a Rook, that likes to sit there as well. 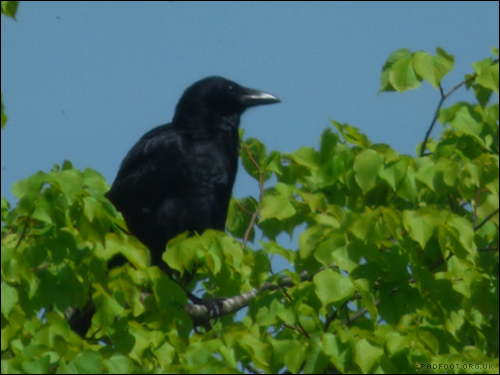 Despite their similarities, the larger of the two appears to be defensive about his patch of ground, frequently swooping towards the smaller crow as it aims for the tree. While the crows are fighting over their ‘perch with a view’, the food in a neighbouring garden is being guzzled up by three large seagulls which have braved landing. Normally they try to avoid landing on the ground, as the garden doesn’t give them much room to take off again, but the lure of whatever food was put out, proved too great. This entry was posted in General on May 25, 2016 by Dragon. Looking out of the window today, I spotted a few small birds flying over the trees. Instead of just flying in a straight line like the crows do, these were swooping, diving, circling and generally putting on an aerobatic display. It was incredibly difficult to get a photo of them, so this is one I took on a previous occasion, when they were flying around the country lane I was walking along. Yes, that bird is flying upside-down! 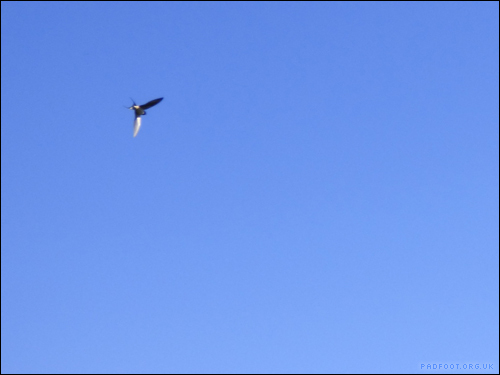 According to the RSPB site, Swifts even sleep while flying! I’m amazed they can perform such tight turns and dives without crashing into the other birds, let alone sleep while flying. This entry was posted in Dragon Goes Wild and tagged 30 days wild on May 20, 2016 by Dragon. I spent a while watching the Peregrine Falcon webcam today – set up by the Hawk and Owl Trust as part of their Urban Peregrine Project, this particular webcam is focussed on a nest box on St John’s Church in the centre of Bath. There are currently three falcon chicks, who look totally different to the adult birds – the chicks are white, rather than the grey striped look of the adults. Admittedly it’s not something you want to watch while eating – you get a ‘ringside seat’ of mealtimes when one of the adult birds brings food to share amongst the chicks. It is a fascinating watch, especially when you realise you’d walked past that church a few times, without even noticing the nest box on the side! 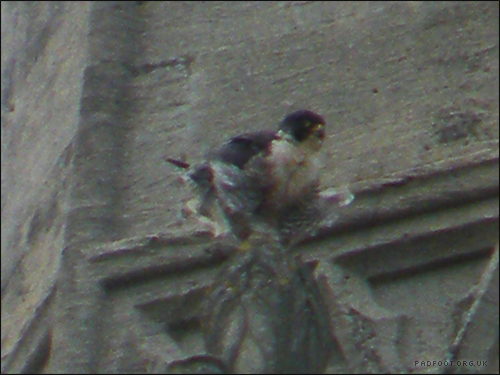 This photo was taken on a windy day in 2011 – we’d been staring at the Church for ages, before a kind passer-by pointed out where the Falcon was perching. This entry was posted in Dragon Goes Wild and tagged 30 days wild, Peregrine Falcon on May 18, 2016 by Dragon. I still find it strange to see the moon in daylight hours, but according to Metcheck, there’s plenty of daylight hour moon rises to come, as we get closer to the next full moon. Today’s moon is apparently a Waxing Crescent – don’t ask me to explain why it’s called that, but it’s the kind of moon that isn’t new, yet hasn’t got to the first quarter yet. 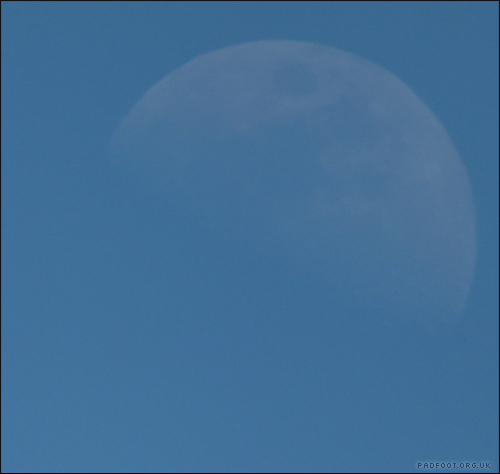 It’s not quite as clear as a full moon would be, but on an afternoon with hardly any clouds, you can see the moon against the blue sky quite easily. This entry was posted in Dragon Goes Wild and tagged 30 days wild, moon on May 14, 2016 by Dragon. There was a strange shouting noise coming from outside today – it sounded like a bird that hadn’t quite learnt how to shout “properly”! 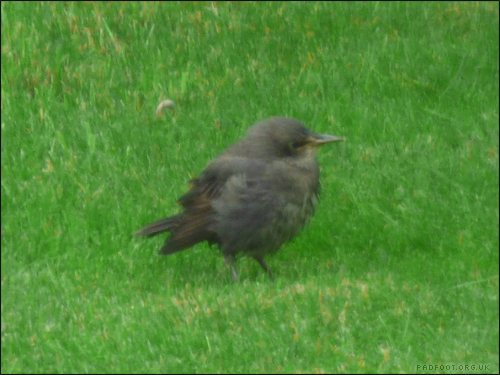 There were quite a few Starlings about, and this little guy, that I’m assuming is a youngster – old enough to peck at the grass, but not old enough to quite look like he knew what he was after. Considering the size of the bird, it’s got a very loud voice! 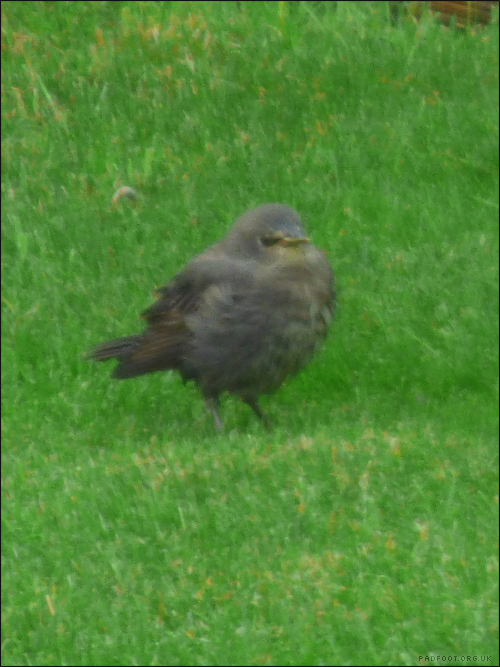 After pecking around the grass for a while, all the Starlings flew off, but I have a feeling they’ll return at some point, to peck around the ground to find more insects to eat. 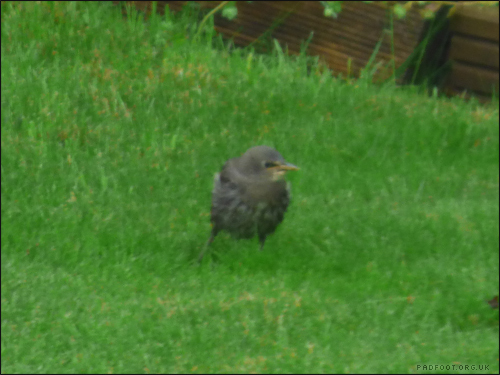 This entry was posted in Dragon Goes Wild and tagged 30 days wild, Baby Birds, Starling on May 12, 2016 by Dragon.